Paint Pocket is a dual stage polyester filter rated at 99.84% efficiency @ 10 Micron (Clear overspray) capturing 6 pounds per square foot that lasts 2-3 times longer than conventional fiberglass filters. Paint Pockets prevent costly maintenance repairs from overspray buildup on fan blades, and exhaust stacks as well as preventing particlulates going into the environment. Polyester filters are a single stage filter that captures 90% of 25 Microns and just over 2 pound per square foot. Effective with all kinds of coatings means an efficient filter medium. Great for intake and exhaust pads. EF filters are composed of 5-7 layers of expanded Kraft Paper. The layered filters capture both single and dual stage paints effectively at 90% at 10 Microns. It is recommended that you use two layers per exhaust to retain an effective capture capability. Fiberglass filters are designed to be inexpensive, replaceable and best used for collection of single stage coatings, varnishes and paints. We offer three grades, 15 Gm (Green) and 22 Gm (Yellow) and 28 Gm (Orange). Efficiencies range from 98-99.4% at 75 – 100 Microns and capture between 1.5 and 2.2 pound per square foot. Pre-Burner filters are essential in preventing outside contaminants from entering the burner unit and subsequently onto the ceiling filters. Filtration efficiencies range from 75 -90%. We can offer filters for high pollen areas. Post-Exhaust filters are your last filter to capture overspray particles before they go past your exhaust fan and into the environment. Our filters are manufactured with a dry tackified media that will hold more than other suppliers white meshed media. Whereas the white meshed media ranges from 45 – 55%, our multi-pocketed filters capture 95% of both base and clear paints. Filtrair media has a high temp rating (225F) along with a high efficiency rating and low air flow resistance makes this filter a great run for your money. This combination means a longer lasting filter that allows more heated air flow to get to your freshly painted surface. Global Finishing Solutions has a very high temp media (250F) coupled with a low air flow resistance ensures your newer high tech spray booth will perform better. Many newer booths have a temperature profile that ramps up higher, so this filter might be best suited for you. 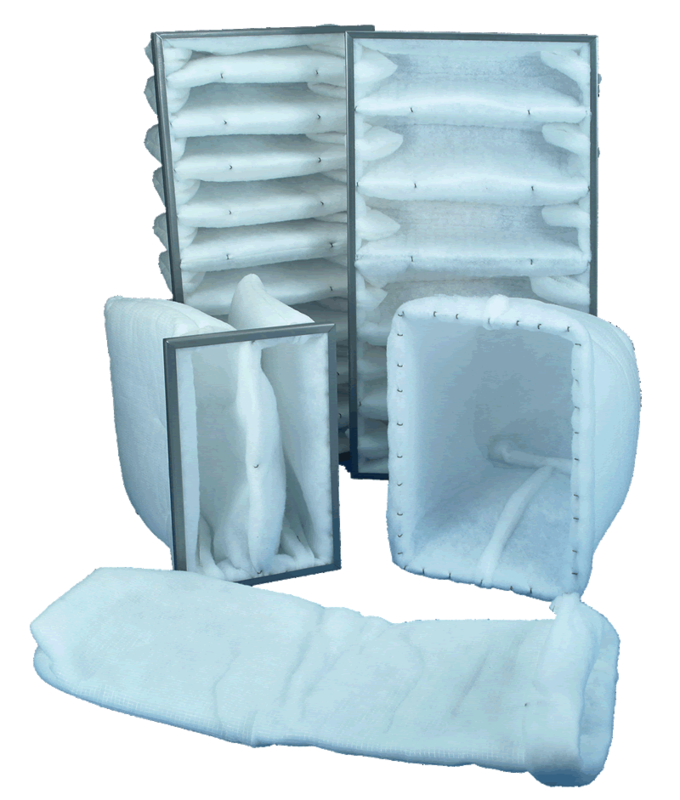 We supply various grades of intake filters for your Cross-draft spray booth ranging from good, better and best. We can discuss each application for your needs. We can supply your U.S. EPA Method 319M required filters. Whether you have 2 stage or 3 stage requirements, we can couple the Paint Pockets HEPPA filters as the first and second stage filter. This will eliminate the second stage filter and save you money. Our aviation filter media captures the highest amount of Chromate particulates down to 0.6 Microns to keep you in compliance with NESHAP requirements. Call for special pricing for your specific size requirements.